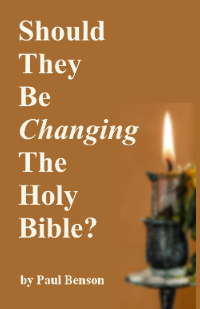 Changing The Truth Into A Lie: Apostasy Means Rapture? – Let's Get It Right! Why is it that the Western Church is so willing to accept wacky alternative renderings of Scripture all the while turning a blind eye to the fact they are so obviously errant? Is this not apostasy in action? Falling away really means catching away? Gee, how could I have missed that? Silly me! Of all the truths critical to the well-being of humanity we can say certainly the most vital center around the love of God for us, and his desire to rescue us from the consequence of sin through faith in his Son and the sacrifice of Calvary. And I hope that divine truth reigns supreme in your consciousness! And there is definite reason that the Apostle Paul said ‘comfort one another with these words’ in regard to the resurrection of the dead and the future catching away of the believers. The reality of the resurrection unto eternal life is the hope of the believer. And we should all be firmly settled in that hope. But as a watchman at the wall I feel divinely compelled to consistently raise warning concerning another vein of truth. And that is concerning the danger of people of faith being seduced away from Christ by the lure of deception. That there are those who can with great subtlety twist the truth into a lie. And they can make these lies sound so plausible and reasonable with their ‘great swelling words of vanity’ (2Peter 2:18) that it can corrupt your understanding of God’s ways to the point you lose your grip on the truth. And this is one area where we had better ‘get it right’! God is a God of Truth. Lies and deceptions are a defilement and an abomination to him! Please read the opening verse again asking the question: What will be the fate of those who turn aside to lies, and defile others with those lies? Scary business. The path to eternal life is truth. We must not depart from that path! Let’s look at another one of those lying notions that is gaining popularity in the Western Church. The deceptive teaching that the apostasy spoken of in 2Thessalonians 2:3 is not a falling away from the faith but is a reference to (and proof of) a ‘pre-trib rapture’! QUOTE: There is a spiritual seduction that goes hand in hand with false teaching. You’ll always find a temptation to the flesh involved in accepting error. Somehow wrapped up in every false doctrine is a benefit to the flesh. Whether it be the exaltation of self, the promise of pleasure, escaping the call to crucifixion, the lure of personal prosperity, or simply an easier route to be had; somewhere in every false doctrine is an appeal to the carnal man. Today I would like to discuss another falsehood that seems to be gaining somewhat of a foothold in the Church today. One that I believe epitomizes the deluding satanic influence at work in the promoting of the pre-trib hoax. Reading those words of the Apostle, and accepting what they plainly teach, we are given one of the clearest and most unambiguous prophetic statements of the entire Bible. That before the Coming of Christ, and our gathering together unto him, 2 things must transpire. A falling away and the revelation of the Man of Sin! Reading those words, and being impacted with what they unmistakably teach, was a big part of what kick-started my rejection of the pre-trib teaching. Quite strangely, and absolutely indicative of satanic delusion at work, many are asking us to believe that Paul was not talking in 2Thess. 2:3 about a prophesied falling away from the truth (apostatizing) that would precede the Second Coming, but instead the supposed pre-trib rapture event! Somehow, in their desperate attempt to turn a blind eye to what is stated in the passage, this ‘falling away’ now becomes ‘caught up to meet Christ’! In their deluded state they are seeing in the passage a physical departure of the Church rather than a departure from the truth that saves. In my mind the fact delusions such as this are today sweeping the modern Church is proof that the day of that apostasy (prophesied to precede the return of Christ) is now upon us! To show I am not just making much ado over a problem which is nonexistent I would like to draw attention to a video teaching of a man named Andy Woods. It is typical of a great deal of teaching from others also on this same subject. He devotes an entire hour to giving what he feels are ten solid points that should cause one to believe it was a pre-trib rapture spoken of in verse 3 of the chapter and NOT a coming apostasy. Why do I feel this video is significant? Mainly because of who Mr. Woods is. This is not some wild-eyed conspiracy theorist living in his mothers basement posting his wacky ideas to the internet. This man is a well known and respected minister. He is president of Chafer Theological Seminary. He is also the senior pastor of Sugar Land Bible Church in Sugar Land, Texas, and spent the previous seven years teaching full-time at the College of Biblical Studies in Houston. The man is completely convinced of what he is saying in this video, and a great many others are swallowing what he says hook, line, and sinker; but, as we shall see, a simple reading of the passage and a little common sense shows his whole presentation to be bogus. It is merely an exercise in the wisdom of man attempting to explain away the truth of God that he doesn’t want to hear! And the very fact so many well known preachers and teachers would spend the amount of time they do promoting notions so easily proven false is quite troubling to me. Why is this happening? Why can they not see their obvious errors? DELUSION! The Western Church has fallen under such an increasingly evident delusion that weird and wacky notions have become the order of the day. They are everywhere you look or listen! And as I said: I really believe it is a sign we are in the end-of-days! If you want to skip the video (it IS a bit excruciating to listen to such obvious error) and jump right to the evidence proving the falsity of such a claim please feel free to do so. But I wanted to illustrate the extreme lengths people are going to in order to turn their ears away from what is plainly stated in the Scriptures. And I wanted to present the matter in such a manner that if you know someone who has bought into that nonsense you could say: “Here – watch this seemingly convincing video; and then read these words that contrast it against what is really stated in the passage. Why are you buying into such dribble?” Please share this article with anyone you think may be benefited by it! I know that some of my efforts may seem a bit redundant; or that at times I might seem to be overly emphasizing certain points. But for various people it takes various triggers to ‘get the light to come on’. And that is the reason I try to hit this issue of deception in the Church from so many different angles. And it is truly rewarding when I hear testimony that others have found help in work such as mine. I recently received an e-mail from a minister who preached the pre-trib lie for 30 years but recently has seen the error of that theology! He is now refuting pre-trib theory from the pulpit! He wanted to thank me for my writings; and I am always thrilled to hear when others figure out that myth needs ‘left behind’ and then do so! I would like to send you into the watching of this video with a helpful heads-up to some obvious deceptive practices at work. And if you are looking for them I am sure you will not miss them. 1. In his efforts to bolster his claim he repeatedly refers to other translations that render the words ‘a falling away’ (apostasy) instead as ‘departure’. He then preposterously claims THEY ALL were thinking like he does – that their usage of ‘departure’ in 2Thess. 2:3 is not speaking of a departure from the faith; but that they also were conveying the idea of a physical removal of the Church (ie. Rapture)! What nerve! Where does he get off making this presumptuous claim? And then repeating it over and over? Non of them placed rapture in the verse, merely departure (which is a fitting description of apsotasy)! Obvious fabrication of evidence at work here. 2. He continually states as fact various elements of pre-trib theory which have absolutely NO Bible behind them. For example: He without qualification states Paul had told the Thessalonians they would be raptured out of this world before the tribulation. Absolutely bogus! There is not one place in the Scriptures where Paul presents any such notion. In truth there could have been NO coming of Christ and NO catching-away as long as the Apostle Peter was still alive since Jesus prophesied Peter would die a martyr as an old man! The early believers knew this! Paul had to have known this fact! 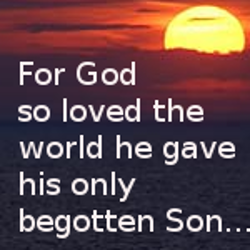 And if he didn’t the Lord Jesus (and the Holy Spirit) that gave Paul his doctrine sure did! Since Paul and Peter died at about the same time (around A.D. 67): the Coming of Christ for his Church was NOT EVEN A POSSIBILITY during the ministry of Paul. Or Jesus would have been a false prophet! Paul was not taught a ‘imminent return’ from the Lord; and he did not teach such a thing to others, nor include such a concept in his writings! Let’s get it right! If left unmolested, and taken for what it truly says, the passage in question absolutely destroys pre-trib theory! That is why it is so frequently attacked, maligned, and wrested by those promoting that fable. That entire video is an effort to steer you away from what is plainly stated in 2 Thessalonians Chapter 2! He has changed the truth into a lie, and is luring his listeners into embracing his false teaching. His words are truly the great swelling words of vanity that both Peter and Jude used to describe the orations of the deceivers! I do not know Andy Wood personally so I cannot comment on his character or his intentions. His intentions may very well be quite noble. (I personally believe most false teachers are well-intentioned! They are just passing along the deception by which they themselves have been deceived; and are thinking they are helping folks learn about God and his ways.) But I can say this: He is teaching things he ought not! He is teaching deception and, sadly, that makes him a deceiver. Jesus taught that those who sit under folks out of sync with the truth end up twice as messed up as their teachers! (Matthew 23:15) People who listen to and receive religious instruction from these ‘learned ones’ that have lost the key of knowledge (Luke 11:52) go away confused about the Bible rather than instructed by it! Now, I ask you, how much sense does it make to say ‘that day’ (the Coming of Christ and our gathering together unto him) cannot happen until after the rapture? Does that sound like a plausible exegesis of the passage to you? The rapture cannot happen until after the rapture happens? But to the biblical illiterate a presentation like that one seems to make a great deal of sense. And he did have a lot of info that kind of seemed to back up what he was saying. But it was all smoke and mirrors. A distraction to get your eyes off what is truly being said in the passage. That is the Devil’s intent behind such wayward teaching as this. To fog up your comprehension of the Word and fill you with error. Such teaching is dangerous; and it is satanic in origin. The only people such preaching makes sense to are those who are feeding off the words of these deceivers rather than taking the time and effort to actually READ the Bible and accept the simply stated truths from which we are to receive our doctrinal beliefs. What does it say about the current condition of the Western Church that so many are so open to anything that promotes the ear-tickling fable of a rapture before the coming time of persecution and chaos that they will accept such bizarre wresting of Scripture? Alterations that turn the Word of God into such nonsensical statements, like: ‘the rapture can’t happen until after the rapture happens’, are swallowed up like candy as long as they provide ANY alternative to the truths which are not palatable to a pampered, pompous, and back-slid generation! This makes me afraid. Seriously afraid! It makes me afraid for me – that I might speak things that are untrue and damaging to the Body of Christ. That’s why I am wary of teaching on things that lack a firm foundation of Scripture; and try to be careful to label all speculations as such. It makes me afraid for you – that you might be seduced aside from the path of truth by smooth words and enticing notions. That’s why I harp on about basing your beliefs only upon what is clearly and plainly stated in the Bible; and recommend being very cautious over doctrine that relies heavily upon implicit reference (or extra-biblical sources). It makes me afraid of the coming day – when we shall all stand and give an account of these things. And YES, that day and that accountability approach rapidly. Those who have no fear of that coming day have not a proper grasp on the Word of God! MORE FOOD4THOUGHT: It is also worthy of note that, in his effort to wrest the meaning of the words ‘a falling away’ in order to promote the pre-trib fable, Mr. Woods leaves unanswered the issue that the passage also states that before the coming of Christ and our gathering together unto him the man of sin must be revealed! Even if his mistaken notion about the words ‘a falling away’ was true (and it certainly is not) the passage STILL disproves a pre-trib rapture by stating Antichrist must come to power first! And if you read further in the chapter it states the glory and power of this Coming of Christ (and our gathering together unto him) destroys Antichrist! How could a pre-trib rapture destroy Antichrist at the end of his 3 ½ year reign of terror? It could not! That is why they must twist the verse’s meaning, introduce much other confusion into the chapter, and then steer you off elsewhere – before what the chapter REALLY SAYS sinks in to your understanding! Has your scholarship hindered your ability of critical reasoning? Please keep your confusion to yourself! You are not benefiting anyone with your mistaken notions about a catching away of the Church before the coming persecution of Antichrist and his war on the Saints. 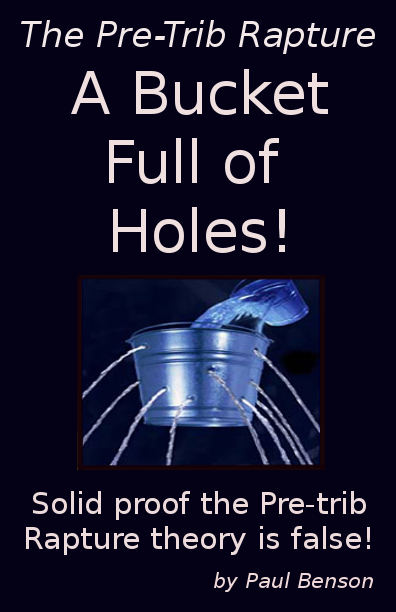 Your modern pre-trib rapture theory is a lie and a provable hoax! That error is damaging the Body of Christ, and will result in a crisis of faith for multitudes in the future time of chaos; and many will stumble and perish. There WILL be accountability! You have been deceived by seducing spirits and have embraced the doctrine of devils; and your teaching of such has made a deceiver out of you! I fear for your eternal state. May the Lord grant us ALL a repentant heart unto the acknowledging of his divine truth! In Jesus name I pray. NOTE: I sent Mr. Woods a link to this article. Thank you. I was appalled when I heard this from his mouth. I wrote prophecy watchers and was summarily dismissed and told by Mr. Bob ulrich, the failed real estate developer turned chrisyian book salesman, that Mr. Woods knew Greek and Jesus spoke Greek, so we all should defer to his educationed opinion. (Summarized) I took great joy, probably not Christian, in pointing out that Jesus never spoke Greek but thanks for educating me, an attorney, on wor interpretation. Lol. Seriously, I’m very concerned for all of their souls. Although many that teach these far fetched concepts are just deceived and repeat the heretical teachings they were taught without knowing how wrong they are there are many that know exactly what they are doing is wrong. The Christian Churches have been infiltrated by Jesuits, aka satanic servants. We are about to enter into the 70th week. All of what’s going on was written about and it’s playing out right before our eyes. We are very blessed to know the difference between wrong and right at this point because the masses clearly don’t. We are the remnant. Thank you for standing firm on the truth. I try to help many understand what Paul was writing about in this chapter as he was making it crystal clear and simple for good reason as some had crept in and lied about a pre trib rapture. Ironic? I think not. It saddens me that people get so angry and aggressive when I try to see the errors in the pre trib fable, they often claim the anger to be from me as if I were attacking them personally. I’ve learned, over time, that its best to help them think through this chapter as a whole in order for them to understand the simple message Paul was delivering. Paul goes over what has to happen twice in this chapter. The apostle corrected any misunderstanding about The Lord’s coming in verses 3 and 4 by reminding them of what he had explained at length while he was with them – that the day of The Lord’s parousia can not arrive until the prophetic events of the tribulation period are fulfilled. Then in verse 6, Paul reiterates his correction to their confusion when he begins: “And now you know what is holding…back.” So what is it that the Thessalonians now know? They were just told and now know that the day of The Lord will not come until after the apostasy occurs and the man of lawlessness is revealed. Those two events were standing in the way of the parousia of The Lord and the rapture. The popular solutions to the identity of the restrainer assume that the man of lawlessness is being held back. But why would Paul be discussing what is holding back the lawless one when the more pertinent information the Thessalonians needed to be reminded of was the fact that certain prophesied events were holding back the coming of The Lord? The whole point Paul is driving home in chapter 2 is that the day of The Lord’s parousia is being hindered! The restrainer, therefore, is holding back the day of The Lord’s post tribulation coming and the rapture of the church. Since the day of The Lord is being held back, then, as we have already discussed at length, the apostasy and the revelation of the man of lawlessness are holding it back, because those two events must occur first. The restrainer, then, is the Antichrist who is revealed after the falling away occurs first. If you are not aware, most English versions of the Bible translate 2 Thessalonians 2:7,8a alike. For example, The NIV says that “the one who holds it back will continue to do so till he is taken out of the way. And then the lawless one will be revealed….” Because of this kind of rendering, nearly all who read this text are led to believe that only when a certain individual is removed will the lawless one be revealed. But we already know that the restrainer is not holding back the revelation of the lawless one. Instead, the lawless one is that restrainer who is holding back the day of The Lord . The mistranslation of the phrase “taken out of the way” is a major reason for the confusion about the restrainer’s identity. First, the word translated, “taken,” is not an accurate rendering of the Greek word in our text. In order to do justice to this passage of Scripture, we must insist on utilizing the normal meaning of words as long as the normal meaning renders a coherent thought and makes sense within the context of what the author is writing. Unfortunately, in 2 Thessalonians 2:7, the normal meaning of the word translated “taken” was not used. Consequently, the translation not only misses the point of what Paul was saying, but it renders the exact opposite sense which he intended. Another example of a grossly perverted translation of verse 6 can be found in the NCV- “And now you know what is stopping that Man of Evil so he will appear at the right time.”, this verse is about Jesus not the Antichrist, they have completely swapped Jesus with the Antichrist. Just look at what the NKJV does with verse 7-“For the mystery of lawlessness is already at work; only He who now restrains will do so until He is taken out of the way”. Do you notice that the heretical NKJV capitalizes the “H” thus giving deity to the Antichrist! Now you know what the dark agenda is on these perverted translations and you know why some of us have such a passion for the truth of the King James Bible. Understanding how these verses have been twisted backwards and used by false teacher to mislead the elect, is it possible that you may have been taught other untruths? I don’t normally post such lengthy comments but your observations are sound. I presented a similar vein of thought in my book ‘A Bucket Full of Holes’. To take the focus of the major subject of restraint (the restraint of Christ’s Return) and make much clamor over the minor subject of Antichrist’s restraint perverts ones understanding of Paul’s discussion on the Second Coming and the deliverance of the Church from their persecutions at that time. And YES, when verse six says now you know what restrains that is in reference to what has already been under discussion up to that point – the restraint of Christ’s appearance and our gathering together unto him. I agree with your sentiment; but I go a step farther. In order to properly understand 2 Thess. chapter 2 you must begin reading at the beginning of the context which is located in the 1st chapter. The chapter breaks often split up a contextual discussion (1Thess. 4:13 thru 5:11 is another example of this), and therefor pertinent info is often overlooked, leading to wrong conclusions which could be avoided by a complete exam of the context. The over-reaching contextual subject of the entire discussion (2Thess. 1:4 thru 2:12) is the Second Coming of Christ. The secondary topic is the persecution of the Church and their deliverance at ‘That Day’ (the Return/catching away); and thirdly the persecutors (the wicked in general and the Antichrist in particular) being recompensed at Christ’s Coming. The ‘that day’ of 2Thess 2:3 is the same ‘that day’ of 2Thess. 1:10! Westerners, especially Americans, are completely coddled and spoiled, expecting only good things to happen to them. Because of this, their faith is weak. They are afraid of testing and trials. Compare them to saints in Syria, Africa, China and other places where Christians are routinely tortured and murdered. We are about to face similar challenges soon. Pray for strength to endure to the end.